The PCL -- similar to the anterior cruciate ligament (ACL) -- connects the thigh bone (femur) to your shin bone (tibia). 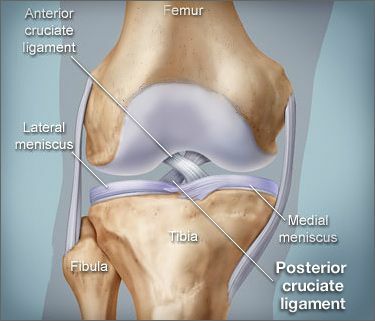 Although it is larger and stronger than the ACL, the PCL can be torn. Grade I: The PCL has a partial tear. PCL problems can be acute or chronic. Acute PCL problems are due to a sudden injury. Chronic PCL problems involve an injury that develops over time. Most people don't feel or hear a "popping" sensation in the knee after a PCL injury. This is more common with an injury to the ACL. Over time, a PCL tear can lead to osteoarthritis in the knee. You may also be checked with a device called an arthrometer. This presses against your leg to measure the ligament's tightness. A pain-relieving medication may also be needed for knee pain. You can recover from some posterior cruciate ligament injuries without surgery. Some people need to go through physical therapy after a PCL injury. This rehabilitation may be necessary with or without surgery. The operation is sometimes done as an "open" surgery. This requires a large incision in the knee. A less-invasive option involves a tool called an arthroscope. The surgeon uses smaller incisions. After surgery, the length of time needed for rehabilitation can range from 26 to 52 weeeks. De Carlo, M. Clinics in Sports Medicine, January 2010. American Academy of Orthopaedic Surgeons: "Posterior Cruciate Ligament Injuries." Frontera: Essentials of Physical Medicine and Rehabilitation, 2nd edition. DeLee and Drez's Orthopaedic Sports Medicine, 3rd edition. Canale & Beaty: Campbell's Operative Orthopaedics, 11th edition.